Oasis Sod Farms - Maintenance after you purchase your sod is important - Delivering top Quality Turf Grasses to Mississippi, Tennessee, Louisiana and surrounding areas. Mow between 2 and 3 inches high. Catch and remove clippings. Never remove more than 1/3 of the leaf at any one clipping. Always use a sharp blade. Can be mowed with either reel or rotary mower. Water to supplement rain shortages only. Avoid fixed timer irrigation settings. 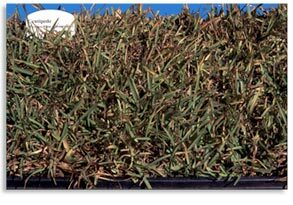 Centipede best performs when it receives about 1” of water a week. Additional irrigation is not necessary. (Example: if 1/2 inch of rain occurs within a growing week, apply 1/2 inch by irrigation. Do not waste water by watering. Apply between 1 and 2 pounds of nitrogen per 1000 S.F. annually, during the growing season. Select a fertilizer that is labeled for use on centipede grass lawns and contains iron. Do not apply fertilizer to wet turf to avoid burning. Too much fertility will result in a thatched and unhealthy lawn. DO NOT APPLY LIME WITHOUT SOIL TEST. Pest can become a problem, especially if centipede is not growing in a healthy way- too much or too little fertilizer or water, etc. If pest persist contact the local county agent or nursery owner and ask for assistance in identification of the problem and recommended control.